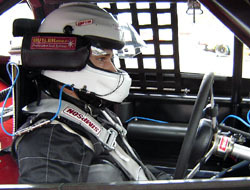 On Saturday afternoon during practice for the Show Me the Money 200 at Birmingham International Raceway (AL), Charlie Bradberry said that he was driving the best car that he had ever had at his hometrack. But even being around at the end of the race was iffy for Bradberry early on. He started third, but with just a handful of laps completed got together with the #15 car of J.R. Dudley in turn four. The incident looked pretty rough, but left Bradberry without any damage. On Sunday afternoon, Bradberry emerged from his car in victory lane to take possession of a glass trophy that contained $10,000 in cash for winning the 200-lap feature. But the win didn’t come as easy as it might appear. There was a lot that happened in the 24 hours between points A and B. There were actually two keys to finishing well at Birmingham. The first was simply staying out of trouble. The second involved the four round objects on each corner of the car. Bradberry dropped back to ninth and would be out of the picture until much later in the race. However, that was somewhat by design. Bradberry hangs on tight to a valuable winner's trophy after the race. Bradberry quietly took the lead on lap 158 and never gave it up. All of the drama left in the race would take place behind him. 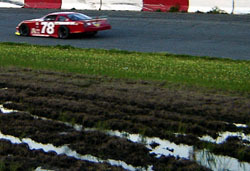 Grill and Hamner got together with four laps to go in turn two. Grill got the worse of it and dropped out of the race. Hamner spun and dropped to fourth with four laps to go. He was able to move up one spot at the end to finish third and might have had the only car running at the end capable of passing Bradberry, but there were not enough laps for him to challenge for the win. Mercer showed that he could run with Wilkinson. The two even used a little bit of strategy with each other. The culprit in ending Mercer’s race early was a broken panhard bar, which dropped him out with 60 laps to go and left him with a 14th-place finish. Matt Hawkins was in the top five when he got caught up in a hard wreck just a few laps later. His #22 was finished for the day, so a good finish would not be in the cards for him. Wilkinson's jack got plenty of use on Sunday, but "John Girl" only got to try it out before the race. Wilkinson was not. 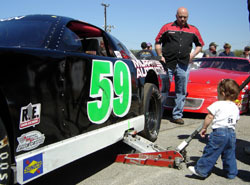 He led for a total of 126 laps, although Josh Hamner, Eddie Mercer and Augie Grill all took turns out front as well. With Bradberry in the back, it looked like one of these four would be the one collecting the cash after the race. But each of those drivers had problems that kept that from happening. The tire gods did not shine on Wilkinson, as he had a cut tire, blistered tire and flat tire at various points in the race. He was able to hold on to fifth at the finish, but did so with the cords showing on one tire and a plug to keep another one from leaking out. That might have let him limp to the finish, but it didn’t do so well when it came to being a late race contender. Gary Helton ran a clean and smart race to finish second and the fact that the Tennessee driver didn’t beat a hometown hero left Hamner thankful. “I’m glad the hillbilly didn’t get the money and it’s staying down here in Alabama,” joked Hamner after the race. The money which he referred to was the $10,000 winner’s purse which was stuffed into a glass trophy presented to Bradberry, under the watchful eye of local law enforcement, in victory lane. “I’ve never held $10,000 before,” said Bradberry. He might not get to hold it for long either. Hamner’s father Jeff is Bradberry’s engine builder and the Hamner family might end up seeing those dollar bills after all. “Charlie’s about to buy a new motor, so we’ll probably get it anyways,” said Hamner. 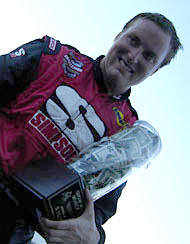 Josh Hamner was one of Bradberry's challengers.